In October, monsters, faeries, movie stars, and cartoon characters appear in the streets, claiming the sidewalks and even approaching the house. Mom and Dad can usually buy them off with candy, successfully deflecting their intrusion, but it does rattle a dog so. Then in November, a swarm of hungry relatives packs into the cramped kitchen. They dine splendidly before settling in with the television, as children pursue the dog around the house. By December, St. Nicholas has to use the chimney, because anyone appearing at the front door is subject to a flurry of frantic barking and jumping! From a dog's perspective, this rash of home invasions is simultaneously exciting, alarming, and irritating. Unfortunately, once a dog has slipped into a frenzy, it's difficult or impossible to get calm, thoughtful behavior again. The job of trainers and responsible owners is to prepare dogs beforehand so that holiday challenges are, well, less challenging. What is reasonable and acceptable holiday behavior for dogs? Humans become accustomed to certain situations, finding it hard to see problems with, let alone alternatives to, those situations. Sometimes it's only when everyday situations are magnified by holiday stresses that a situation comes into focus as a problem. Greeting visitors at the door is one such situation. Substitute a human child, or even an adult, for the dog to assess the subject's behavior. Would you allow your toddler to ram repeatedly into your guests' legs? Leap at them and pull their clothes? Would you look kindly on a friend who, sighting you at a distance, charged at you and launched at your chest, knocking you backward? Would you consult with a businessman who, upon introduction, ignored your outstretched hand and instead began hugging and kissing you? Would you think it acceptable to isolate your child in a back room when guests came because he couldn't say hello properly? It's easy to see that these behaviors are inappropriate, even ridiculously so. Yet we accept them from our dogs, because we don't know they are capable of better behavior—or we don't know how to teach them otherwise. It is to your advantage to teach your dog to greet others calmly, rather than charging ahead in excitement. It doesn't take much imagination to see how a mid-sized dog could easily injure an elderly relative, but risk isn't limited to large dogs and frail humans. I've had clients who were knocked down stairs, who broke a wrist stumbling over dogs underfoot, or who were forbidden to visit their grandchildren when accompanied by their dogs. Teaching appropriate greeting behavior is important for the dogs' safety as well. That frantic, excited greeting is often mistaken for aggression—or simply recognized as inappropriate social behavior that needn't be tolerated—by other dogs that then react defensively. I see more dog scuffles caused by rude greeting behavior than by anything else. I love it when a client tells me he wants his dog to stop jumping on guests. Clicker trainers know it's far more efficient to teach the dog a desirable behavior than to try to teach him to stop an undesirable one. Clicker trainers know it's far more efficient to teach the dog a desirable behavior than to try to teach him to stop an undesirable one. "You want him to stop jumping? What do you want him to do?" "I don't care—just no jumping!" I produce my patented wicked smile. "Hmm. Not jumping could include barking insanely, running about the room, chewing on my pant leg, peeing on my foot… Are all those behaviors okay with you?" "What if we teach him to sit to meet people?" When the focus is on the problem, it's difficult to define the desired behavior. I ask clients to describe what the dog should be doing instead. I tell them that if at that moment they can't give a clear picture of the correct behavior, then they should walk away, because they don't have anything to train yet. Responding to a "bad" behavior without teaching a replacement "good" behavior will only create conflict. Of course, there is a variety of acceptable greeting behaviors; choose one that suits both your dog and your situation. An anxious dog may benefit from a mat or crate that has been conditioned as a reassuring "security blanket." This station can be placed near to or far from the door as needed. The mat is a good option for most dogs, but it's great for worried dogs! A low-threshold dog may need an acceptable outlet for his excitement if it won't be suppressed easily. 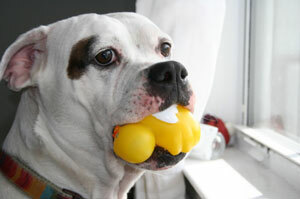 I find many of these dogs benefit from having a toy to hold, something that lets them channel some energy orally. Even at age five, my hair-trigger Laev picks up a toy to greet new arrivals so that she can keep her paws on the floor or sit to greet. Without a toy, there's a chance she'll jump on the guest. It's like steam in a kettle; the pressure has to go somewhere! It's much, much easier to train a specific behavior than a vague one. Choose the type of greeting you'd like your dogs to present to guests. Sit in front of them? Lie down near the door and wait to be approached? Decide on one correct response and train for that, rather than permitting different behaviors at different times. It's harder for the dog to know what's expected if he is variously rewarded for sitting, standing, lying down, and trotting around the room quietly (even if you would be satisfied with any of these behaviors). There's still time to train your dog before Halloween! But you can't expect to overturn a lifetime habit in a few haphazard minutes; you'll need a systematic approach. Break down the training plan to achieve the goal you have in mind. Let's use the goal of asking a dog to sit to meet a guest as an example. Start with the basics. Many frustrated owners complain that their dogs don't sit to meet guests when they are excited. But, upon testing we find that the dogs don't know the cue "sit" reliably, even without distractions. It's pretty simple to capture or, if necessary, lure a sit. Keep in mind that you will need to generalize this behavior—a dog that has learned to sit facing you in the kitchen may not realize that you mean the same thing when he's facing away from you (toward a stranger) in the front hall! You'll need to practice this in a variety of places. And that's not even mentioning the obvious triggers: a car in the driveway, knocking, or the doorbell. When I train, I start these distractions at the smallest possible increments. (Someone generously called me the Queen of Splitting the other day, and I could think of no greater clicker compliment!) For many dogs, these exercises start at a completely neutral door with no history of visitors—how about a pantry or closet door? Cue "sit," knock once on the pantry door, click/treat. Letting the dog watch you make the sound, and taking the training completely out of the front door context, focuses on the single criteria of holding the sit during the trigger noise, and does not several potential triggers together. Cue sit, knock twice on the pantry door, click/treat. Build up to vigorous knocking on the pantry door. By this point, the dog should be entirely relaxed and happily expectant when you knock. Cue sit, grasp the pantry doorknob, click/treat. Cue sit, turn the knob, click/treat. Cue sit, pop the pantry door latch, click/treat. Cue sit, open the pantry door an inch, click/treat. Cue sit, open the pantry door as if for access, click/treat. All of these steps can be broken down into even smaller steps if necessary. Remember to click only the solid, reliable sit you want to keep; if the dog is shuffling or excited, drop to a lower level of distraction and review. Kathy Sdao describes suction cups on the dogs' paws as a metaphoric goal—"tap-dancing" in place is a sure sign of arousal and impending failure. Remember to take frequent breaks (5-10 reps at a time is usually plenty) and be sure that your treats or other reinforcer are valuable to the dog. The "paycheck" should make self-control worthwhile in the face of exciting visitors. When the dog's behavior is solid with an unimportant door, that's a good start toward desensitizing. It's also teaching that knocking or the doorbell provides an opportunity for the dog to earn reinforcement, and is not a cue for a whirlwind of arousal. Next up is to extend the training to the entry door. Remember to review previous criteria as you introduce this new criterion, the front door. Cue sit in the front hall, click/treat. Cue sit in the front hall, reach toward the door, click/treat. Cue sit in the front hall, touch the doorknob with one finger, click/treat. Cue sit in the front hall, grasp the doorknob, click/treat. Add knocking, the doorbell, a family member outside, a neutral stranger outside, a cheery stranger outside, etc. Add each element one tiny step at a time. Occasionally someone protests these training increments, "But he's totally fine in the kitchen—why do we have to take all these steps? It's not until someone's coming in that he starts misbehaving!" Training starts well before the mistake becomes apparent. The early steps let the dog figure out exactly what you want. While you may think "calm down at the door!" is perfectly obvious, an enthusiastic welcome may seem more natural to a dog. More importantly, the multiple steps establish a reinforcement history. Defining a contract, asking the dog only for something he's capable of doing and that will be worth his while, is an invaluable training foundation. Many dogs have never had a successful experience at the front door. They don't even try to figure out what an owner is asking there, because they don't believe it's possible to find a "right answer." Defining a contract, asking the dog only for something he's capable of doing and that will be worth his while, is an invaluable training foundation. Even with the many baby steps, clients report so much more progress in a single hour's lesson than in months or years of trying to fix the problem behavior more directly. Splitting may feel longer at first, but splitting works much faster! The single most common problem I see training successful greeting behavior is that the humans skip ahead to the final steps, assuming that's appropriate since the dog is doing well. One owner told me that mat training didn't work after all. I'd seen her dog going quite readily to settle on the mat after their initial training, so I asked what she meant. She explained that her dog had indeed been doing fine, so she'd sent the dog to the mat when her Thanksgiving guests arrived—all 17 of them! Of course the dog had bailed off the mat. There are quite a few steps between learning to settle in an empty room and staying there while 17 food-bearing people enter! Be sure to continue the training in small increments. If the dog makes a mistake, simply back up and review, or consider whether you can break a step down even further. Remember, too, that this is hard work, especially for enthusiastic dogs. Reinforce generously and often. If your house receives many trick-or-treaters, Halloween is a great opportunity to practice greeting behavior, but only if you've already done your foundation work. It's often best to have two handlers, one to click and treat the dog and one to wrangle and treat the sugar-crazed kids. If your dog starts to tire and make mistakes—this behavior is difficult after all—quit early and put him away in a safe place for the rest of the night. If your dog is startled by a costume, let him flee to a safe place. Pressuring him to stay will only create distrust in your foundation work, making future training more difficult. It's better to move away and start over. Never force your dog to remain near something that frightens him, especially if a child is involved. After consistent reinforcement for the behavior you want, your dog will find it's not worth his time to bark or jump—he can get attention and more for offering polite behavior instead! After consistent reinforcement for the behavior you want, your dog will find it's not worth his time to bark or jump—he can get attention and more for offering polite behavior instead! Your dog has learned to recognize old triggers as new opportunities. Because you trained for the behavior you want, broken into small steps, the dog believes he can be successful. Add some tempting savory smells to your criteria, and you'll be ready for Thanksgiving. By Christmas, your dog will be greeting your guests with a stocking in his mouth! Editor's note: Laura VanArendonk Baugh is a professional trainer and KPA faculty member. She lives in a tall house at the end of a long gravel lane where she never receives any trick-or-treaters at all. Submitted by Gill Martin on Wed, 2011/11/23 - 9:39am. I have Mum, Daisy, collie x springer (6 yrs old), Daughter, Bronwyn, 3/4 collie x springer (4 yrs old) and Tilly a 12 week old Dachshound x Border Terrier. I live in a rather remote rural area so visitors are very rare, so practicing 'visitors' has been a constant trial. The two older dogs are fairly well behaved but people coming to visit is a nightmare. My daughter has Bronwyns sister and three children 10, 6 and 5yrs old. They arrive like a whirlwind of barking dog laughing yelling children and a moody mother. we don't do knocking at doors so they all burst in, it's like a circus, with dogs, cats, chickens and children flying around the place all like mad things. I've decided to clicker train my little Tilly, (hence finding your great site) so have also started it with the 'big girls' too. So, i suppose my question is, how do i get to grips with these infrequent visits. Also how do i school the children? At the moment it's "fold your arms and WALK into the kitchen" then i must admit the dogs are left out in the porch for the duration of the visit. I end up feeling guilty that the dogs are outside and angry that i can't do anything about it. Submitted by SaralynSharp on Sun, 2010/10/17 - 9:09am. I can get my mastiff mix to sit on a spot about 8 feet from the door, but I am having trouble stopping the barking. She is not very toy motivated and it took lots of clicker training just to get her to pick up a toy so she's not very enthusiastic about holding one in her mouth to greet. Does anyone have any other suggestions on how to release tension without barking? Submitted by trainer@canines... on Mon, 2010/11/01 - 11:51am. Hi! Sorry I didn't see your comment before. If you're getting much barking while she's sitting, you're probably moving a bit too fast. Barking, like "tap dancing" and other displacement behaviors, are a sign that there's still too much steam inside, that the situation is still too arousing for the dog. I suggest splitting into smaller pieces and don't move ahead until she's giving only 1-2 barks or no barks. 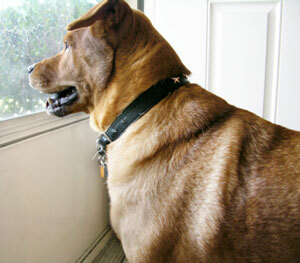 (I allow/encourage some barks at the door, because after all, dogs do provide a valuable doorbell/alarm service! but once I've approved the visitor, the dog should settle promptly.) When you see barking again, drop back to the previous criteria and review. Mastiffs, like my guardian breeds, are supposed to be a bit wary at the door, and it may take more training to overcome this natural tendency than another breed might need to greet calmly, but it's very possible. Splitting critiera and moving at her own pace is your best bet!